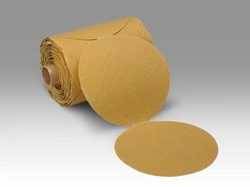 An aluminum oxide Stikit™ disc roll constructed on a F weight, extra heavy paper backing. Resin bonded for heat resistance. Regardless of your grinding and finishing applications, 3M can help with its full line of quality coated and bonded abrasives. Belts, discs, sheets, rolls, wheels and specialty items in a limitless combination of minerals, backings, and bonds offer solutions from a name you can trust.